Occasionally, I change the route of my morning walk, and head out to the local lake. There is a campground at the lake that I skirt the edges of while I’m walking and basically end up wandering right past people’s tents. That’s where the trail leads, I’m not trying to snoop—honest! When I pass by the tents it brings back memories of camping with my Girl Scout troop. We had a very fun (and brave) Girl Scout leader when I was in high school. She led us on all kinds of amazing adventures that involved camping on beaches, in forests, and out in the desert. I also remember the time we were camping in Joshua Tree National Park and we cooked over Buddy Burners (also called Bunsen burners) that we’d made. Let me tell you, if you’ve never cooked on top of a tin can, you’ve missed out! It requires a little patience (though not nearly as much as putting your food in a pit and waiting half a day for it to be ready) but when you’re all done, you feel like a super smart scientist with a full stomach. 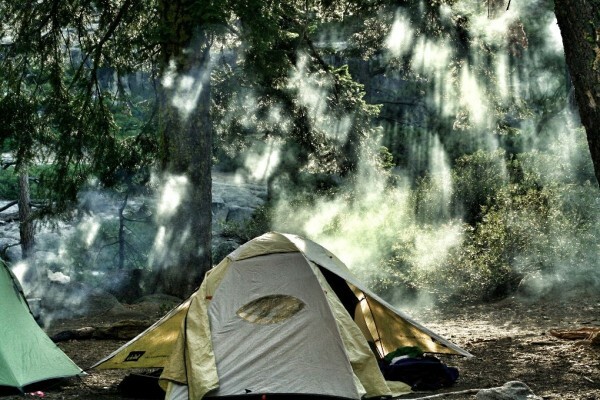 It appears, however, that camping has changed dramatically in the past 40 plus years. This morning, when I was walking past the tent campers, I inhaled the amazing scent of sizzling sausages, and then heard a bit of a rumbling sound. I was shocked when I discovered the source of the noise was a portable generator that was hooked up to the pancake griddle. Isn’t that cheating? I mean, where’s the whole “back-to-nature” aspect of camping when you bring along your own electricity? Camping isn’t supposed to be easy, people! It’s supposed to make you tough and equip you with survival skills for your future! Granted, I may not be the one to criticize. These days, my idea of camping is staying in a hotel without room service. I might be convinced to spend a night at a campground were it inside the relative comfort of a motor home, but my tenting days are long gone. Let’s just say a couple of mosquito-ridden camping trips soon squashed my back-to-nature ambition. Although, to this day, when I walk past the beautifully appointed motor homes at the lake “campground,” I do get a little itch to spend a few nights “in the wild” comfortably sleeping inside an air-conditioned home on wheels. And then, I think about driving one of those bad boys and decide instead to go back to the comfort of a hotel. But, just to show I can rough it a little, I’ll skip the room service. You are such a hoot! Thanks for the smiles & laughter. It brought back many a memory for me also. We will be watching 4 of our grandkids for 12 days in August. (3,6,8,9) During that time, we have planned a 4 day camping trip to Hayward. We will do all cooking inside the 5th wheel on the stove, with air conditioning. Building memories the modern way. They get annual boundary waters and rough camping with mom & dad! No judgment here on “modern” camping with grandkids. I’m impressed you do it at all. It sounds exhausting! But, you’re right, lots of great memories!